January is always a month to remember. Do you know why? Because a rose flower always blooms on the 23rd. 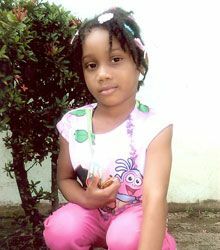 Happy 5th birthday to Rachael Victory of Sandy Bay. Greetings from mom Ronelle, dad Darren, grandparents, aunts, uncles and cousins. We wish you a happy birthday and pray that you live to see many more. We love you, baby.